Data collected using the high resolution spectrograph HARPS-N installed at the Telescopio Nazionale Galileo (Roque de Los Muchachos, La Palma island) were used to characterize the planetary system around the star Kepler-107. This remarkable system can contribute to understand the origin of our Earth-Moon system. Kepler-107 is a star located in the Cygnus constellation at a distance of about 1700 light years, with a radius of 1.4 Solar radius and a mass of 1.2 Solar mass. The star is not magnetically active, making easier the determination of the planetary parameters. The four sub-Neptune sized planets orbit the star with periods of 3.18, 4.90, 7.96, and 14.75 days. They form a compact near-resonant system with period ratios almost equal to ratios of small integers. This property implies that the Kepler-107 planets likely formed further out and then migrated inward getting trapped into resonances during the process. The orbital eccentricities of all four planets were determined to be low, consistent with circular orbits. The team led by astronomers from INAF-Osservatorio Astronomico di Torino gathered over a hundred of radial velocity measurements in three years (Fig. 1). Combining Kepler photometry and HARPS-N spectra they found a rocky composition for Kepler 107-b and c, having a nearly equal radius (around 1.5 Earth radii) but different masses (3.5 and 9.4 Earth masses respectively). The values for the mass and the radius of Kepler 107-d (3.8 Earth masses and 0.86 Earth radii respectively) indicate a possible rocky composition also for this planet characterized by an iron fraction at least a factor of two greater than that of Kepler-107b. The same results for Kepler-107e (8.6 Earth masses and 2.9 Earth radii), indicate that this planet is like a mini-Neptune containing a significant fraction of volatile elements in the form of thin H/He envelope and/or water ice. The outer planet Kepler-107c is more than twice as dense as the innermost “twin” Kepler-107b. Therefore, Kepler-107c must have a larger iron core fraction than Kepler-107b. This difference in density cannot be explained by an evolution of the system connected with stellar XUV irradiation, which would conversely make the more irradiated and less massive planet Kepler-107b denser than Kepler-107c. Instead, the dissimilar densities are consistent with a giant impact event on Kepler-107c that would have stripped off part of its silicate mantle. This hypothesis is supported by theoretical predictions from collisional mantle stripping, which match the mass and radius of Kepler-107c. Giant impacts are thought to have occurred in our Solar System and have been invoked to explain the composition of Mercury, the origin of the Earth-Moon system and the high orbital obliquity of Uranus. The analysis published today in Nature Astronomy shows that a giant impact likely also occurred in the exoplanetary system Kepler-107 (Fig. 2). Figure 1. 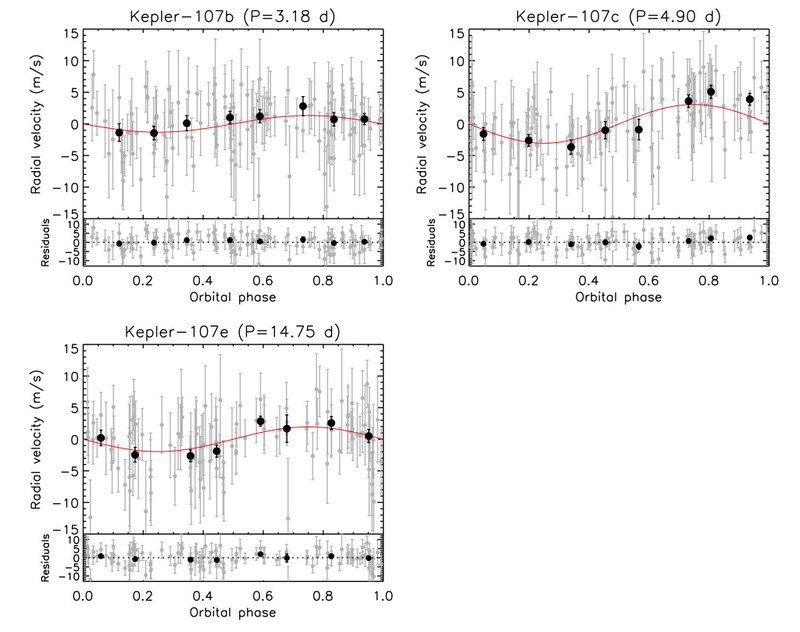 Radial velocity measurements of Kepler-107 with HARPS-N. More information at the paper: Aldo S. Bonomo et al. “A giant impact as the likely origin of different twins in the Kepler-107 exoplanet system”, Nature Astronomy. DOI: 10.1038/s41550-018-0684-9 Nature. Figure 2. Colliding Super-Earths: The videos shows a hydrodynamical simulation of a high-speed head-on collision between two 10 Earth-mass planets. The temperature range of the material is represented by four colours grey, orange, yellow and red, where grey is the coolest and red is the hottest. Such collisions eject a large amount of the silicate mantle material leaving a high-iron content, high-density remnant planet similar to the observed characteristics of Kepler-107c. Credits: Zoë M. Leinhardt and Thomas Denman. School of Physics, University of Bristol UK.